Need other information? Try the HomeSeer TEMP08 forum here. 1. What is Parasitic Power? 2. Do I need a Dallas Weather Station to use the LOG08? 3. How do I connect the temperature sensors to the LOG08? 4. Can I daisy-chain temperature sensors? 5. How far away can the temperature sensors be run? 6. Where do I get a Weather Station? 7. How does LOG08 connect to my PC? 8. Can the sensors be used in water (pools, fish tanks, spas, etc.)? 9. How can I tell which sensor is in which area? 10. What do I use for power? 11. What do I need to read temperatures from a few different rooms? 12. Do I have to use HomeSeer to read the temperatures? 13. Will LOG08 work with a serial to USB converter? 14. Will LOG08 work with a Humidity Sensor? 15. Is there an enclosure for the LOG08? 16. What are the differences between a DS1820 and a DS18S20? 17. How do I set up HyperTerm to talk to LOG08? 19.What is the difference between a Version 1 and a Version 3 One Wire Weather Station? 20. I ordered DS18S20's, but the items I received are labeled DS1820. What gives? 21. Will LOG08 work with DS18B20, DS1920 and DS1822 temperature sensors? 23. I added a sensor and now my readings are coming back as "???". Why? 24. Where can I buy a Humidity Sensor? 25. My outdoor temperature sensor appears to be inaccurate. What can I do? 26. I connected a sensor to the board. How do I get it recognized? 27. Does LOG08 interface with the SHT11/71 humidity sensor? 28. How do I connect sensors around the house? 29. How do I connect a DS2405, DS2406 or DS2407 to other components? 30. What are the pins used for on the RJ11/12 connectors? Parasitic Power is a term developed by Dallas Semiconductor to describe their method of powering their "1-Wire" devices. The DS18S20 sensor used by the LOG08 is one of these 1-Wire devices. As the term implies, there is only one wire (well, 2 really. A ground is also required) used to communicate on a bus with all devices. The power is derived from the communication line. Whenever a logic "1" is sent on the 1-Wire bus, all devices on the bus use that logic "1" to charge up their internal circuitry. Providing that a logic "1" is sent often enough, that charge is sufficient to drive the individual devices. Fortunately, the idle state of the bus is a logic 1, so, statistically, a logic 1 is present very often. The sensors are connected via twisted pair wire, typically CAT-5 or better, to connector J3 or J5. The external wire can be "home run" (all sensors connected on their own wire and all end-points tied together), or daisy-chained (one, or more, wire runs are used and each sensor is "tapped" into the wire run where needed). The sensors themselves are then soldered on to the wire run wherever they are needed. If you don't like soldering these devices, some people have had success with crimping the sensors into RJ-11 plugs and running wires to RJ-11 sockets where the sensors are needed. Midon Design also provides small PCB mounts for attaching a DS18S20 sensor and either a RJ-11 connector or 2 terminal screw connector. They are shown here. NOTE: if you are using parasitic power, you must connect the ground wire to both outer pins of the DS18S20 to ensure reliable readings. Yes. They can be wired into anywhere along the wire run from LOG08. A termination is not required at the end of the wire run when daisy-chaining, although care should be taken to avoid shorting out the end point. Using good quality CAT-5 cable, you should be able to run sensors up to 300 feet (100 meters) away from the LOG08. The original manufacturer (Dallas Semiconductor) no longer makes this product. One manufacturer Tecnologia Aplicada (AAG) has replicated the original design (see also question 19). Another source of similar product is Texas Weather Instruments Inc. . Midon Design has verified functionality of Technoligia Aplicada and Dallas Semiconductors products with the LOG08. A straight-through, not null modem, serial cable connects between the LOG08 and your PC's serial port. The signal is 9600 bps, no parity, eight bits, with NO flow control. Hyperterminal can be used to monitor output from the LOG08, or to configure it. See also #17. Here is an example of a serial cable that could be used to connect to your PC. Yes, although care must be taken to ensure that the connections to the sensor, and the sensor leads, are properly water-proofed. Silicon RTV or epoxy could be used to accomplish this. The recommended method is to connect one sensor at a time, run the INI command on LOG08 and then record the newest serial number found in the list displayed by the DIS command. That serial number will appear in the sensor output if the Show Serial Numbers option has been selected..
LOG08 will notify you in real time as you connect and disconnect temperature sensors, providing that the sensor had initially been registered with LOG08 via the INI command. Just about any power adapter can be used with the LOG08. Your adapter needs to be between 9 and 20 Volts AC or DC with at least 100mA current capability. All items are on the ordering page. The LOG08 connects to your PC via a spare serial port. You will need a straight-through serial cable, not a null modem cable, to connect LOG08 to your PC. An example cable would be Radio Shack's 26-117. Note: if one of the temperatures you want to sense is in the same area as where you will place the LOG08, then you will only need one extra sensor since there is one already built onto the LOG08 board. No. Any PC application that reads the serial port can be used. HomeSeer provides some simple to use script and plug-in interfaces to the serial port, however. Yes. LOG08 has been successfully tested with a Belkin F5U103 USB Serial Adapter. Yes! LOG08 will read humidity from multiple DS2438 Humidity sensors from either Midon Design, AAG or Hobby Boards. Yes. The PCB will fit into a standard PacTec CM5-125 enclosure. This enclosure is orderable from Midon Design or available from multiple other sources such as Allied Electronics, Mouser Electronics, Fry's, and SMC Electronics.. The document here describes this best. Basically, the DS18S20 has superior temperature accuracy and a wider power supply tolerance. 19. What is the difference between a Version 1 and a Version 3 One Wire Weather Station? The Version 1 OWWS is the original unit developed and sold by Dallas Semiconductor. It is electrically equivalent to the Version 2 OWWS sold by AAG, a Mexican company. AAG improved the design to replace the DS2401-based wind direction sensors with a new DS2450-based design and are now selling it as the Version 3 OWWS. LOG08 does support the Version 3 OWWS, but does not support the Version 1or Version 2 OWWS. Dallas/Maxim have chosen not to label the DS18S20's with the "S". This may be due to the fact that they have discontinued the original DS1820 package and assumed that there would be no confusion. The DS1820 stopped production around May 2000. The only visible difference is the package style. The DS1820 was in a PR-35 package, whereas the DS18S20 is in a standard TO-92 package. See FAQ #16 for the electrical differences. You might have added a the sensor via a new wire leg in a star configuration. This might have created reflections on the One Wire bus. Try adding a 100 ohm resistor (Radio Shack part number 271-1311) in series with each leg of the star (only on the DQ lead). The figure below shows how the wiring should be done for this. 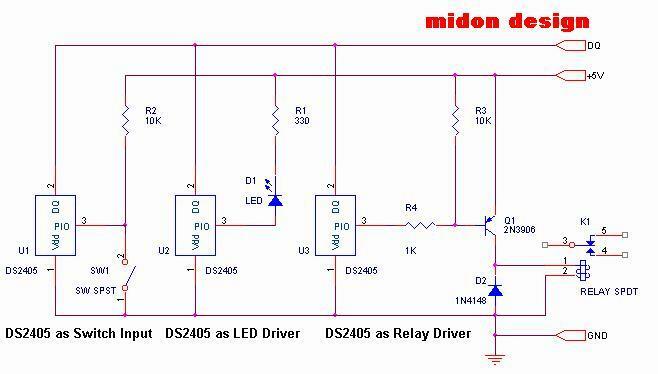 Midon Design sells a 1 Wire Humidity Sensor as part number MD3020E. They were originally available from Dallas/Maxim, however, Dallas/Maxim announced the discontinuation of this product. An alternate source is Hobby Boards. Go to this link to view the Midon Design version. AAG also sells a humidity sensor, however, it is only available in parasitic power mode. From a HyperTerminal session, issue an INI command. This will find the new sensor and add it's serial number to EEPROM memory. There is no need to do an ERA command, which will erase all the EEPROM memory, unless you want to delete some or all of the other sensors that were previously recognized. The new sensor(s) added by the INI command are automatically added to the next available (usually the last) memory position. If you want to delete some, but not all sensors, use the DEL command to do so. No. We have looked into using the SHT (Sensirion) sensor series but decided that the 2 wire interface used to connect to it was not conducive to remote applications like the One Wire bus is used for. Please see an excellent discussion about this on the HomeSeer message board here. The following schematic is good for any of the DS2405, DS2406 or DS2407 1-wire devices. As can be seen, the PIO port can be used for switch (or contact closure) inputs, or as an output to drive LED's, relays, or other devices. The pin numbers are numbered per the diagram here.